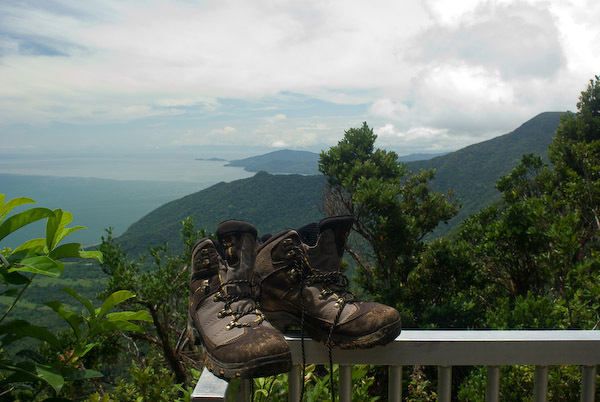 Whilst at Cape Tribulation, I had to wait for low tide to cross the Bloomfield, so I headed up the Mount Sorrow Ridge trail. Though it's only a 3.5 km walk up to the top, it's a climb of about 680 m and it's another spot where the information signs are basically trying to dissuade you from trying to do the walk at all. It was a fun walk. I sweated buckets and was soon completely saturated. I reached the top, which is unfortunately a lookout with no shelter from the sun, and it was an unusually clear day, so there wasn't much opportunity to cool down. There was, however, respite from the leeches which had been climbing up my boots in huge numbers for the duration of the climb. Every few steps I had had to stop and flick them off. There were also many, many spider-webs that I continually walked through, and these I also had to remove lest I become encased in a silken sarcaphogas. On the way down, I ran into another walker about a kilometre from the top. He was exhausted, the sweat pouring off his forehead. I guessed, correctly as it turned out, that he was German. He wanted to know how far it was to go and I told him he had the worst of the climb ahead of him, so he seemed keen to take a break and have a chat. His name, I found out, was Robin.. It transpired that he was a fellow biologist so we talked about some of the things we'd spotted. "Did you see the goanna on the way up?" I asked. He had. "Have you seen a Boyd's yet?" He hadn't. I'd seen one the night before, sleeping down near the start of the track. It was his turn - "Did you see the peppermint stick insects?" I hadn't seen them. They live on, and eat, Pandanus and I just hadn't been on the look-out for them. Our conversation drifted to other topics and my eyes strayed off to the side of the track. Just ten metres away, on a buttress root, was perched a Boyd's dragon! I was very pleased to point it out to Robin, and left him to photograph it as I continue down the ridge. Only a few hundred metres down I came across a pandanus plant, evidently heavily chewed. 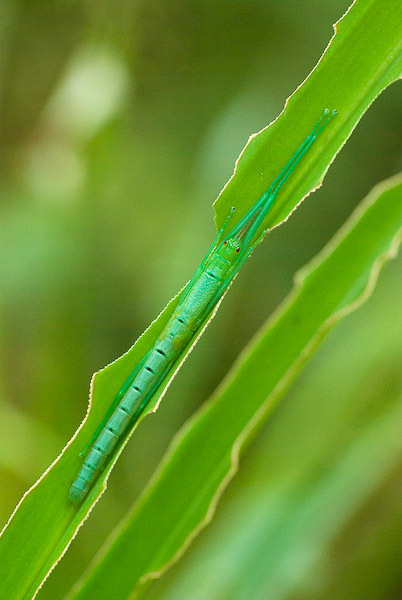 It didn't take long to find a couple of the Peppermint stick insects that Robin had mentioned. These beautiful insects have a milky defensive secretion which they squirt from nozzles behind their head. It smells, as you may have guessed, like peppermint. I continued down to the base of the ridge, very satisfied with my pleasingly symmetrical little encounter. Enjoying the blogs so far. We're planning a trip upto Cape Trib June/July and wondering what parts to take in during 3-4 days. Was the Mount Sorrow walk a highlight considering it writes off most of a day, or are there other better wilderness places to be doing hiking/ nature watching/photography on a limited-time trip? Best info. I really liked your article. Thanks so much for the post, pretty helpful information.